January and February are, apart from the summer, my favourite time of the year, moviewise. Blockbuster season, as frequently disappointing as it can be, still fills me with a sense of wonder and excitement every time I go into the cinema since there's a good chance I will see something spectacular. January and February gives me the same thrill on a much smaller scale since it's not only around this time that all the Oscar contenders come out, but also when all the weird little films that, for whatever reason, I missed the first time around come out on DVD. 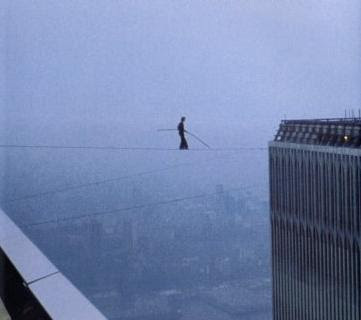 I've been catching up with a few of them recently, and probably the most stunning is the British documentary, 'Man on Wire'. It's impossible, that's sure. So let's start working. British climber George Mallory, when asked in 1924 why he wanted to climb Mount Everest, uttered three simple words: ''Because it's there''. Admittedly he disappeared when trying to climb Everest, but such a sentiment may be shared by Philippe Petit, the man who, on August 6, 1974, along with some of his friends and a few inside men, broke into the under-construction World Trade Centre and strung a wire between the two towers. The next day, August 7, Petit spent nearly an hour walking on the wire between the towers, suspended a mile and a half above the ground. It's a story so crazy that it has to be true; some have called it the 'artistic crime of the century', and now we get to see how they did it. Though a fascinating, straight-forward documentary could have been made from this premise, director James Marsh saw the potential in the story as a heist film, and that is precisely what he has created. Using a mixture of interviews, live-action recreations and archive footage, Marsh walks his own high tension wire act as he builds suspense around a story that we already know the conclusion of. The film takes its time establishing the obstacles that stuck in Petit's way, essentially saying that the task that confronted them was impossible. Step by step, it details the months of meticulous planning that went into it, the need for Petit to get into the WTC beforehand to confirm the measurements, the recruitment of people to help them get all the equipment into the buildings, and the final, excruciating 24 hours in which they had to set everything up and carry it out. Danny Ocean would be bricking it at this point. It does seem too incredible to be true, but such is life. The larger than life story is accompanied by interviews with the principle characters, including Petit himself, who is arguably the lynchpin of the entire project as he was the central figure of the crime itself. Even as a man pushing sixty, Petit has an impish energy to him that is absolutely irresistible. He truly is a man who has lived life to the fullest and exactly how he wanted, conquering mountain after mountain, or building after building, and achieving the seemingly impossible. His charisma is infectious and adds verisimilitude to the recreations, to the extent that I soon lost track of whether or not some of the footage was recreated or was in fact some found footage that Petit and his friends had made to document their act. Such is the blurring of fact and fiction in the tale. Marsh is not afraid to veer from the cinema verite angle, at some points using a style that veers on the expressionistic. The scene in which Petit and his associates set the wire up between the two towers, shot in black and white, at the dead of night, looks like something from a lost Orson Welles film. The stark contrast and the hazy, dreamlike imagery (elongated shadows, tiny set, the image of Petit walking naked on the roof, searching for the wire) is beautiful to behold. As with everything in the film, the real Petit is not far away, and the scene is a sublime representation of his emotions as he stood at the top of the world, preparing for his moment in history. It's a truly astonishing scene that only barely stands out in an already astonishing piece of work. What surprised and delighted me most about the film is that there is no overt reference to the tragedies of September 11, 2001. The opening of the film, comprised of news footage of builders using cranes to raise building material, may be an eerie reversal of footage that would be seen 30 years later, but otherwise the film does not broach the subject. This is crucial, I think, to the sheer beauty of the film. James Marsh has explicitly said that he hoped to restore a positive image to the World Trade Centre with this film, and I truly believe that he succeeds. He takes a place which has become so central to our world and all the terrible things in it and, if only for 93 minutes, reminds us of what a wondrous thing those towers were, what they represented and the inspiration they instilled in Philippe Petit, and a similar inspiration is instilled in the audience as a result. It is a beautiful sentiment that is achieved by being so unfalteringly entertaining, rather than sanctimony, and is an astounding story about that human desire that George Mallory touched upon with his pithy remark; the desire to do the unthinkable, and the power of such an act.